Mobile advertising – sooner or later will be a boon to online advertising. It is now a rapidly growing sector providing brands, agencies and marketers the opportunity to connect with consumers beyond traditional and digital media directly on their mobile phones. With growing technology today mobile phones can be utilized for much more than just making and receiving calls like SMS, Interactive games, MMS, Photos, Audios, Videos and of course the still growing Mobile Web. Online mobile advertising has made a great use of mobile web and has made it easy for the advertisers to reach them. The best part in mobile advertising is that the mobile phone is an extremely personal device i.e. one mobile phone typically has one unique user. This makes the mobile phone a precisely targeted communication channel, where users are highly engaged with content. As a result, the mobile channel delivers excellent campaign effectiveness and response levels compared to other media. With going time, mobile ads are getting more interactive, today it’s just not about a thin quarter-inch deep banner (static banner) which when clicked just take you to the landing page but a click on mobile banner might lead to a full screen takeover, displaying high-resolution photos or a video clip that the user can interact with or can also lead to a map, take you to a brand’s Facebook page, or generate a phone call to a call center. It’s a big change in mobile advertising, too different than what we used to see some years back and due to this big change or can say the evolution of mobile rich media has made advertisers to spend and put some interest more on mobile advertising. It’s 2013 now, 4G generation where mobile web is no less than Desktop web, Mobile advertising has not acquired its full goal but has created a solid foundation and has become trust able too. It’s no more in its infancy stage but has stepped up to the next level. Many brands and organizations are generating tremendous results with it, showing good ROI, consumer engagement and response rates. 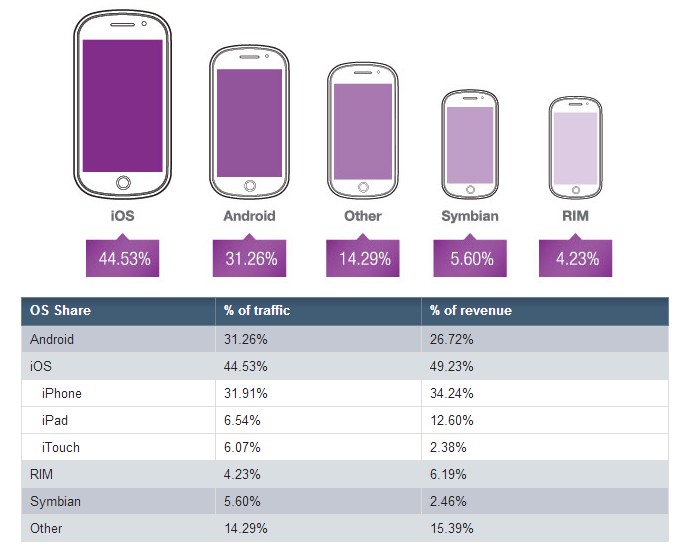 iOS continue to hold a strong position, accounting for 8 out of the top 10 devices on the exchange. Can anyone give a brief instructions on how does an Ad serving happens or Ad is called on a mobile platform? Thanks for your reply, I had a confusion regarding the serving of ads via Mobile but now I have clear picture about this. I want, i do online advertising for realstates bussiness. Can you please let me… What is exactly Programmatic Ad Operation what difference between in Ad Operation & Programmatic , please let me know? The ad operation job is same in every division, the only difference comes in the platform you will be working on. Programmatic ad operation is about trafficking the campaigns in multiple DSPs where the optimization, bidding step is self-managed. To work in programmatic you need to be well aware of different DSP’s like DBM, mediamath, turn, etc. whereas in normal ad operation team all you need to be aware of ad server platforms like DCM, Sizmek, DFP for publisher side.